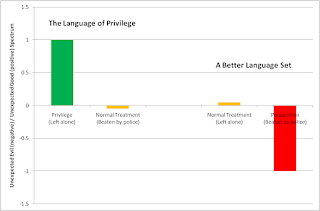 At long last, I have identified what it is that really bugs me about the language of Privilege. You know, as in Male Privilege or White Privilege. I mean, I already had two solid objections to it before my epiphany this morning. For one thing, in practice it is mainly used to shut up white males. If a Liberal has no substantive reply to a valid point made by someone who is white, male, or both, she merely has to reply with, "Check your privilege!" Which roughly translates to: "I haven't got any substantive answer for you, but you shut up, because your Privilege makes anything you say invalid." Then, too, I have noticed that all the successful people who are from racial minorities or who are women have never achieved that success by wringing their hands about Privilege. They either ignore it, or find a way past it. But what I noticed this morning was something else, which may be the real reason so many object to the term. And it has to do with where you draw the "zero line" for what is tolerable in the treatment of one human being (or set of human beings) by another. For it the language of Privilege, simply being treated fairly or being left alone is labeled as Privilege, when clearly it should not be seen that way. Being treated fairly should be the norm! If you Google the phrase "examples of white privilege", you'll turn up links like this one. And what are the examples given in these lists of White Privilege? Because of white privilege, you’ll never have to worry about becoming the victim of law enforcement officers. Thankfully, you’ll never have to know what it feels like to see your teenage son’s death being mocked. White privilege means not having to worry about your hair, skin color, or cultural accessories as the reason you didn’t get a job. White privilege means you don’t have to worry about being monitored in a store just because the hue of your skin is a bit darker than most. Now hold on just one second here! These are PRIVILEGES!?!?! No, these are all things that didn't happen ... they are non-entities, non-events. It is not a privilege to not be beaten by police officers. This is how everyone ought to be treated! If some groups are not (and I don't dispute this fact), call it a crime against the injured parties, not a privilege for those who simply didn't get persecuted. What are the effects of calling it Privilege to be simply left alone? 1. Being mistreated is now the norm. You are being treated better (given a privilege) if you are not mistreated. This is no way to go through life looking at things. 2. The "Privilege" is seen as the problem, and therefore solutions are implemented to punish those who have "Privilege." But the fact that some people are not persecuted is not the problem: the problem is that some are! By this verbal shell game, those who use the language of Privilege have diverted attention from where it belongs (punishing those who persecute and mistreat members of groups they don't like) to a place where it does not belong (those who, minding their own business going about life, have the gall NOT to be persecuted.